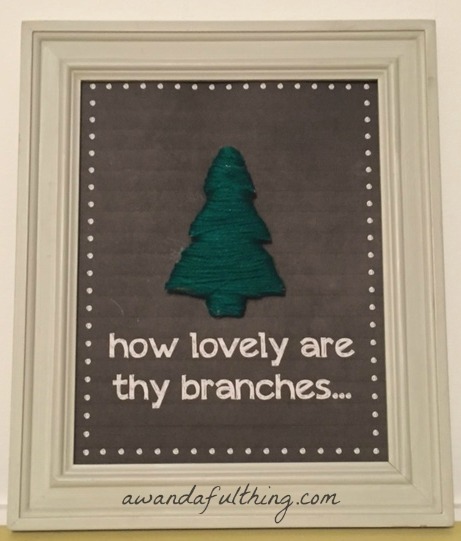 While I was searching for the words to the song ‘O Christmas Tree’ I came upon an intriguing post that gave all the instructions for an O Christmas Tree wall hanging that was just a little bit different than simply printing out an image and inserting it into a frame. It’s adorable, simple and inexpensive to make. Check out Ann’s Entitled Life here for the full instructions. You will need cardstock, a printer, cardboard, green yarn and a picture frame. I wasn’t sure about the color of my frame until I put the print in it. I really like the pale frame as it doesn’t distract from the green yarn tree. I am thinking I might need to make two and give one away at Christmas. 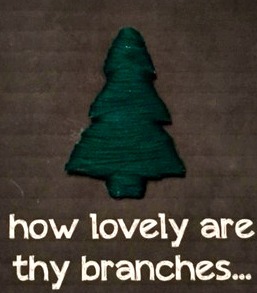 O Christmas Tree wall hanging, its A Wandafulthing! This entry was posted in Decorate, DIY and tagged 12 Days of Christmas, Blog, chalkboard, Crafts, creativity, Decorate, DIY, easy, frame, hanging, print, template, tree, wall, wall hanging, yarn. Bookmark the permalink. I can see a few other similar ideas like a red bell.